The King Janak was known as "Rajeshree" Janak for his quality of both King and that of a Rishi. It is Belive that he even plough his paddy field, and in this process he got Sita also Known as "Jankai". Janaka also arranged a test of strenth in which suitors vying for his dauther hand in marrage would have to sring the great bow of lord Shiva (Horo Dhanus). Lord Rama's Passed this test of strenth' and marry with Sita.Janaka was also well verses of Shastra and Vedas as any rishi. In Bhagawat Gita Sri Krishna Also Give Him to A name Karma Yogi ( Karm Yougi Means man who do her works properly and with Honesty)..
One of the greatest poets and Patek Philippe Calatrava Replica dramatists in Sanskrit. His chronicle of the kings of the Raghu clan ('Raghuvamsha'), the great play 'Shakuntala' and other works depict, through many great characters, the highest ideals of life as seen by the ancientpeople of Bharat. There are hundreds of languages in the world. However, great and classical literature which people in all countries need to read is found only in a few languages. One such great language is Sanskrit. It is one of the oldest languages. 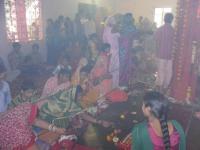 It is the mother of several Indianlanguages such as Hindi, Bengali and Marathi in the North. Kannada, Telugu and other languages in the South have also been nourished by it. It needs the genius of poets who create literary epics and great thinkers for a language to achieve world-renown. Sanskrit is eminently lucky in this respect. Sages' celebration of the wonders of nature, the sky, the stars, mountains and rivers, the sun, the moon, the clouds, fire ('Agni') and their devout offering of prayers to the Universal Power are all found in the Vedic classics which/are in Sanskrit. Puranas and historical epics like the Ramayana and the Mahabharata vividly describe the battle between the good and the evil. They also portray the virtues like devotion to truth, a sense of sacrifice, heroism, cultured living, etc. In Sanskrit there are also beautiful stories of birds and animals like Panchatantra; stories extolling good and basic qualities of wisdom and intelligence. Sanskrit can also justly boast of a rich treasure house of plays, poems and many scientific and philosophical treatises. 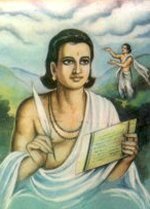 A poet who has made a distinct and glorious contribution to this sumptuous Sanskrit literature is Kalidasa. He has pictured in his works the beauty in life and pondered upon how we can give pleasure to others by generous and graceful behavior.His portrayals are vivid and heart- warming; his wordpower is unique. In a few words he is capable of bringing out the entire meaning intended. His writings touchingly show up a noble, meaningful mode of life for the people to pursue. His works are an intellectual treat to thinkers and common readers alike. Chanakya was adviser and prime minister to the first Maurya Emperor Chandragupta (c. 340-293 BC), and architect of his rise to power. Kautilya and Vishnugupta, the names by which the political treatise Arthaúhâstra identifies its author, are traditionally identified with Chânakya. Some scholars consider Chanakya to be "the pioneer economist of the world and the "the Indian Machiavelli".Chankya was a professor at Taxila University and is widely believed to be responsible for the first Indian empire. 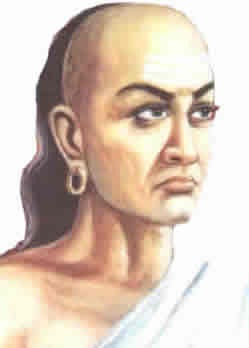 He is generally called Chanakya but, in his capacity as author of the Arthaúhâstra, is generally referred to as Kautilya. The Arthaúhâstra identifies its author by the name Kautilya, except for one verse which refers to him by the name Vishnugupta. One of the earliest Sanskrit literature to explicitly identify Chanakya with Vishnugupta was Vishnu Sarma's Panchatantra in the 3rd century BC. K.C. Ojha puts forward the view that the traditional identification of Vishnugupta with Kautilya was caused by a confusion of Harry Winston Premier Replica editor and originator and suggests that Vishnugupta was a redactor of the original work of Kautilya. Thomas Burrow goes even further and suggests that Chanakya and Kautilya may have been two different people. Legend:- The court of Chandragupta Maurya, especially Chanakya, played an important part in the foundation and governance of the Maurya dynasty. Works:-Three books are attributed to Chanakya: Arthashastra, Nitishastra and Chanakya Niti. The Arthashastra discusses monetary and fiscal policies, welfare, international relations, and war strategies in detail. Many of his nitis or policies have been compiled under the book title Chanakya Niti. Nitishastra is a treatise on the ideal way of life, and shows Chanakya's in depth study of the Indian way of life. Chanakya is born with a complete set of teeth, a sign that he would become king, which is inappropriate for a Brahmin like Chanakya. Chanakya's teeth are therefore broken and it is prophesied that he will rule through another. The Nanda King throws Chanakya out of his court, prompting Chanakya to swear revenge. Chanakya searches for one worthy for him to rule through. Chanakya encounters a young Chandragupta Maurya who is a born leader even as a child. Chanakya's initial attempt to overthrow Nanda fails, whereupon he comes across a mother scolding her child for burning himself by eating from the middle of a bun or bowl of porridge rather than the cooler edge. Chanakya realizes his initial strategic error and, instead of attacking the heart of Nanda territory, slowly chips away at its edges. Chanakya betrays his ally the mountain king Parvata. Chanakya enlists the services of a fanatical weaver to rid the kingdom of rebels. Chanakya adds poison to the food eaten by Chandragupta, now king, in order to make him immune. Unaware, Chandragupta feeds some of his food to his queen, who is in her ninth month of pregnancy. In order to save the heir to the throne, Chanakya cuts the queen open and extracts the foetus who is named Bindusâra because he was touched by a drop (bindu) of blood or of poison. Chânakya's political rivalry with Subandhu leads to his death. When Shankracharya arrived at Prayag, he met Kumarilbhatt who was in his dying moments. Kumarilbhatt advised him to go to Mahishmati in the district of Saharsa in Bihar and to have a debate with Mandan Mishra, a renowned scholar. In the debate, the wife of Mandan Mishra, Bharati acted as the mediator. The debate between Shankar and Mandan Mishra continued for many days and Mandan Mishra was finally defeated. Bharati then challenged Shankar for a debate saying that the victory was not complete as she, as the better half of Mandan Mishra, had not been defeated. Shankar accepted her challenge and the religious debate began. But when Bharati changed her topic to Kamashastra (sexual science), Shankar demanded some time to answer those questions which Bharati accepted. Shankaracharya left that place. On the way he saw a dead body of a king being carried to the cremation ground for the performance of the last rites. By his yogic powers, Shankaracharya translocated his soul in the body of the king and preserved his own body keeping it safely somewhere. King Virat the father of Uttra and father inlaw of Abhimanyu . Abhimanyu. was son of Arjun and is known for his bravery in the battle of Kurushetra. Uttra was born in Village Uttra near benipatti. curse his wife to be a stone. The place is known as Ahilya Sthan which is now in Kamtaul Darbhanga. Vidyapati was one of the famous poet in Mithalanchal. 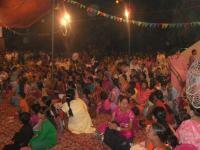 His bhakti songs & poems are even now been sang with complete devotion . One famous story is associated with him, that lord Siva was very satisfied with his devotion & blessed him that he will stay with him but to hide his identity stayed as his servant. He is known as "Kabi-Kokil" in Mithalanchal . 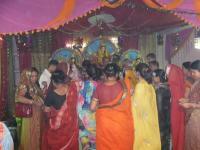 Sita wife of lord Ramachandra was born at Janakpur in Mithalanchal . The war between Ram & Ravana was fought due to her abduction. One interesting story associates with her birth that King Janak found her during plowing of a paddy field which is said to be Sithamathi in Bihar. Shara Sinha is famous folk singer of Mithilanchal. Her songs are largely sang and loved by The people of Mithilanchal and all over Bihar and Nepal. 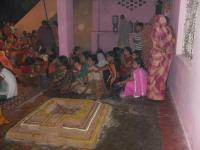 One of her famos song is "jay Jay Bhairav Asur Vayabhinih" is been sang every where in Mithilanchal . Udit Narayan jha is popularly Known as Udit Narayan. He is a living legend for Mithilanchal. 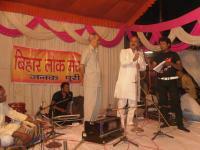 He is famous for his hundreds of Hit Hindi, Bhojpuri and Maithili songs. He is praised for playback singing in Hindi Cinema. He is a proud Maithil and a proud for Mithilanchal.Udit Narayan is a well-established playback singer in the Hindi-language Bollywood film industry. Born in a village called Bharadah in Saptary, Nepal, Udit Narayan began his career by singing Maithili and Nepali folk songs for Radio Nepal in the early 1970s. In 1978, he moved to Mumbai on a music scholarship. In Mumbai he trained in Indian classical music for six years at the Bharatiya Vidya Bhavan. He got his first break in 1980, when noted music director (composer) Rajesh Roshan asked him to do a song for the Hindi movie Unees Bees. But the actual success story of his career began in 1988 with the superhit Bollywood movie Qayamat Se Qayamat Tak, fetching him a Filmfare Award, the Bollywood equivalent of the Oscar. The film also happened to bring actor Aamir Khan, actress Juhi Chawla, and singer Alka Yagnik to stardom.